This shot is from the Ray Soper gallery contribution titled "Chiltern Queens of Woodcote" click on the title if you would like to view his Gallery and comments. This is the ex demonstrator which was tried out by LT in the Reigate and Caterham areas and also by A&D. The body was removed and transferred in modified form to an AEC chassis in around the mid ’70s. The Dennis chassis was seen on waste ground outside Charlton Queens garage in 1976. Source: "Happy Family" "The story of Yellow Bus Services Stoughton" by N Hamshere and J Sutton. No ISBN number unfortunately. The Reliance with this body on it was offered for sale in Bus & Coach Preservation a few years ago, and was stated to be "50% restored". Does anybody know where it is now? David Kaye, in “Meccano Magazine” of February 1963, on his “Calling all Bus Spotters” page, said that the Pelican was designed to compete with UF single deck market, with vehicles such as the Leyland Tiger Cub, Royal Tiger and Olympic and the ubiquitous AEC Reliance, but was too late on the scene to achieve any success. After Yellow Bus were taken over by Aldershot & District, the vehicle went firstly to TMS and then Daisy of Brigg. With no mention of Chiltern Queens, it’s possible that that move took place after Feb 1963. As Chris indicates, the only problem with the Pelican was its late arrival, in the autumn of 1956, on a market already dominated by the Reliance and the Tiger Cub, and, at the lighter end, by Bedford. The boom years were already over, and Dennis simply missed the boat. The company recognised the reality of the situation by not putting the Pelican into production. 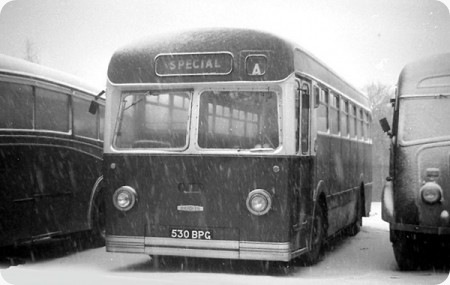 The Guildford firm could not compete on price with AEC and Leyland, though it equalled, and sometimes bettered both on quality. In specification, the Pelican, with its 5.5 litre engine uprated to some 92 bhp and five speed constant mesh gearbox, seemed to be directed particularly at the Tiger Cub market. The Leyland had the 91 bhp O350H engine of 5.76 litres and, initially, only a four speed constant mesh gearbox was available, though a two speed axle was an option. Where driver acceptance was concerned, the Reliance beat all others hands down with its excellent all synchromesh five speed gearbox. It also had the more powerful 6.75 litre AEC AH 410 of 98 bhp, or the 7.685 litre AH 470 of 112 bhp, but these AEC wet liner engines proved to be decidedly troublesome. When bodied, all three competing models weighed about 6 tons unladen. Leyland captured much of the early BET business, but AEC soon worked its way into the company, municipal and independent sectors. There was nowhere for Dennis to go, and it wisely bowed out of the fray. (There was surely a lesson here for Guy with the Wulfrunian.) Nevertheless, the solitary Pelican then went on to a fully productive life of some eighteen years or so, which surely testifies to the initial quality of the engineering and also to the subsequent support by Dennis to keep this unique machine running. I was in Woodcote earlier this week and noticed a planning application to demolish the old depot / garage to be replaced by a small housing estate…. To be honest, I didn’t realise that it was still there and thought that it was long since converted to industrial units…. Those who might want final nostalgic visit have about eight weeks before demolition….